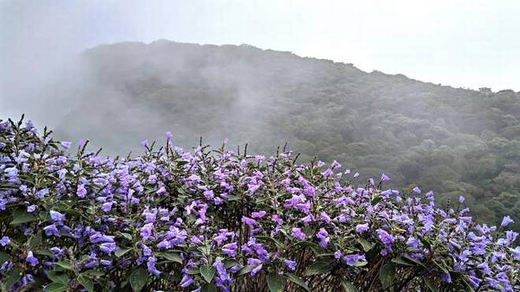 Mangaluru, October 23, 2018: Students of an engineering college in Mangaluru claim they spotted the rare Neelakurinji blossoms in Kumara Parvatha hill ranges on the Western Ghats near Kukke Subrahmanya. Sukumara K, Chetan Kumar, and Vivian Joel had gone trekking to the hill ranges on October 19 and 20. “It was unexpected and the best experience during our trekking this time,” Mr. Sukumara told The Hindu. “It was my third trekking trip to the parvatha. Earlier, I used to hold the same neelakurinji plants for support while climbing the hills. Now they have flowered. We enjoyed a lot,” he said. The students began their trek on Friday afternoon and stayed at Girigadde overnight. They began climbing the parvatha from 6 a.m. on Saturday and spotted the flowers for the first time at Marigundi. Later, they saw them beyond Kallu Mantapa. “Many trekkers were tired and returned from Kallu Mantapa. But we went beyond to see the flowers,” he said. Mr. Sukumara said they had wanted to visit Munnar to see the flowers that bloom once in 12 years. But, now their wish has been fulfilled.